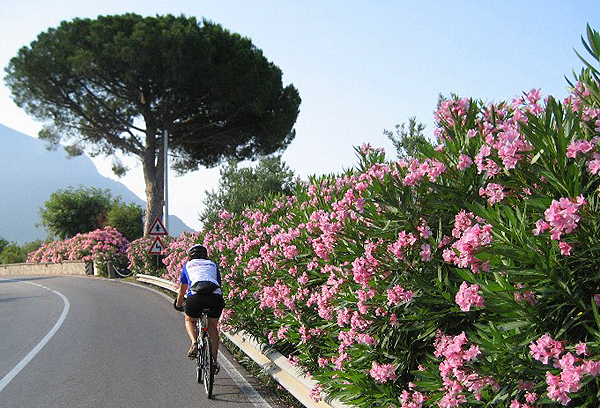 Cycling is a great way to explore the stunning natural and cultural treasures of the Amalfi Coast and the sorrento Peninsula. Although sometimes busy (and so you’ll have to choose where and when to ride) it offers some of the most awesome cycling roads you could ever imagine. The blue Mediterranean on one side, the sheer mountain cliffs on the other, you’ll cycle through quaint fishing villages and mondane resorts, all stunning located along what perhaps is the world’s most beautiful coastline. The Sorrento Peninsula, of which the Amalfi Coast is the southern side, offers some of the most scenic routes in the world, while visiting beautiful towns including Positano and of course Amalfi itself. Views of the island of Capri and the Amalfi coast stretched out across the bay behind the turquoise waters of the Tyrrhenian Sea or small picturesque ports filled with fishing boats or small yachts never fail to impress. And all the cycling will help to build our appetite for the fine food that the area is famous for! 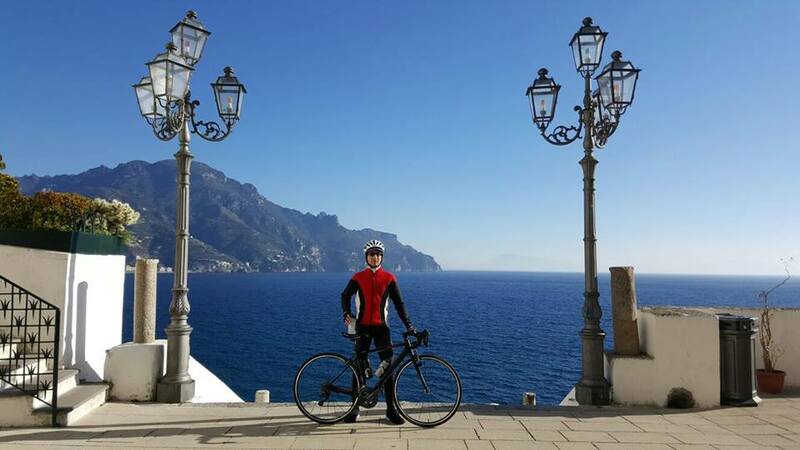 How fit must I be to cycle the Amalfi Coast & Sorrento ? Basically there is only one ‘flattish’ road, the coastal road. But nothing is really ‘flat’ in this area. Even the easiest road will take you over a few ‘hills’, and therefore you’ll need a minimum level of fitness and some experience with cycling in a foreign country (where the traffic is not always as ‘back home’). The easiest part, with the least ups&downs, is the central area of the Amalfi Coast, roughly between Positano and Maiori. Here the altitude oscillates between sea level and about a 100 m. The same holds true for the northern coast, roughly the area between Castellammare and Sorrento. West of Positano a stunning ride takes you over the ‘Colli’ (hills) to the plain of Sorrento, a pretty challenging ride, but feasible for most cyclist with a reasonable condition 8and a good bike!). East of Maiori another great ride brings you up to the Capo d’Orso (170 m.) and then down to the beautiful villages of erchie, Cetara, and last but not least Vietri sul Mare, famous for its ceramics. To get to Ravello is a challenge apart. Located at only 1 km. from the coast, it towers above the Mediterranean at an impressing 370 metres. A ride of about 5 km., with a maximum grade of almost 35% will take you from sea level to the central square, where you’ll deserve a cool drink! In case you do want to fully enjoy the scenery, but do not want to get the sweaty part of it, a beautiful E-Bike tour might be the right choice. 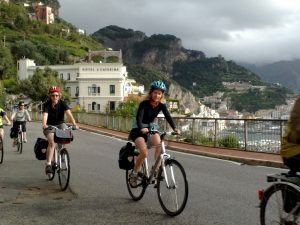 We offer three different E-Bike tours along the Amalfi Coast, of which 2 are specially designed for riding an E-Bike. 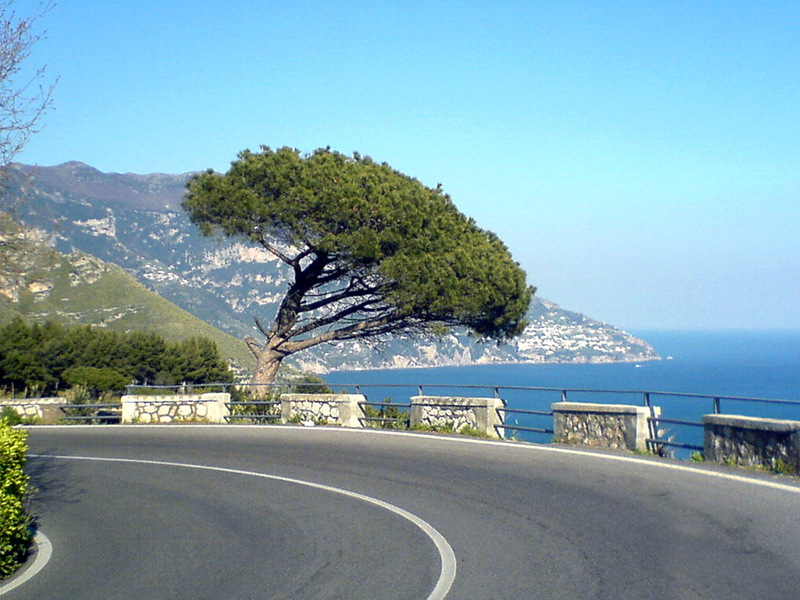 One of the most memorable aspects of cycling along the Amalfi Coast are the high mountains next to the sea. There’s something special about riding along cliff tops above the beach and then zigzagging up to almost a 1000 m. within sight of the sea. Especially when you’ll pass the statue of the legendary Fausto Coppi, from where you can enjoy stunning views of the cliffs and beaches from above. There are several stunning routes, which for a trained cyclist can all be done in only a few days (after all – the whole peninsula is not that big!). 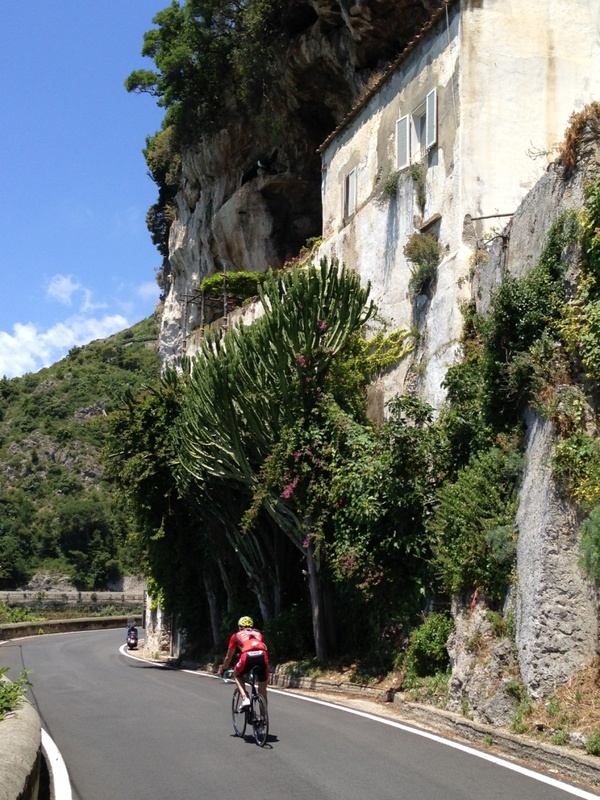 Those who want to take in all the stunning routes should have a look at the Amalfi Coast Bike Challenge!